The last few months of 2016 were very interesting for anyone interested in the running of the WIA. Much of the main items of interest have appeared in News releases posted to the WIA website. The News releases have reflected the views of the majority of Board members. Many others have sought to air differing views, especially via social media. I received several emails requesting views to be published as “Over to You” items. Virtually all of these were unacceptable due to the content. A small number I thought could be published with alterations, but the authors were unwilling to accept my suggested changes, so these items were not published. WIA Directors Paul VK5PAS and Andrew VK6AS spent a considerable amount of time (and I expect many dollars from their own pockets) visiting Clubs to explain the issues that they saw as of concern for all WIA members. I attended one such briefing in Melbourne in mid-November. The newly appointed Treasurer and Assistant Treasurer spent considerable effort in attempting to sort out the details of the financial situation of our organisation and presented a report to the Board. The text of that report was subsequently published to the Internet. It is not clear as to how the report was published. A strong campaign was mounted on social media, seeking to obtain the signatures of at least 100 members to a document that called for the WIA to call a General Meeting. The call for the meeting included motions for four of the current Board members to be removed from office. The documentation for this call for a General Meeting was submitted the the National Office on 29 November. As reported on the WIA website and addressed in the President’s Comment in this issue, the Board received legal advice that a number of the individual documents were incomplete, and thus the required 100 member signatures was deemed to have not been met. Shortly after this decision was reached, several resignations were tendered in a short time frame: the Treasurer Chris Hendry VK3PAT, Assistant Treasurer Jeff Tubbenhauer VK5IU and Directors Paul Simmonds VK5PAS and Andrew Smith VK6AS all departed. The Board decided to not appoint additional Directors to the resulting vacant Board positions. In addition, President Phil Wait VK2ASD announced that he would stand down effective the end of the AGM in May. With four Board members at the end of their two-year term at the end of the AGM, the result is that the already announced election process will determine the composition of a new Board. The term of that new Board commences after the conclusion of the AGM in May. Nominations for the election close on 31 January 2017. The call for nominations appeared on page 23 of the December issue of AR. Note that nominations must be in hard copy and received by the office by the closing date. The roles to be filled are significantly more onerous than undertaking a Committee or Officer role in a Club, having requirements under Company law. Under normal circumstances, it is expected that voting papers should be included with the March issue of Amateur Radio. One theme that has appeared in many places is the importance for the WIA to continue. Most of those who have contributed to various discussions, including Paul VK5PAS and Andrew VK6AS, stress the importance of amateurs being members of OUR organisation. The most effective manner to have any influence over the running of the WIA is to be a member. Some members will nominate for the Board vacancies. The election process will proceed in due course. When the time to vote comes, I urge every member to consider carefully how you allocate your votes. Be sure to vote and have your say in the process. 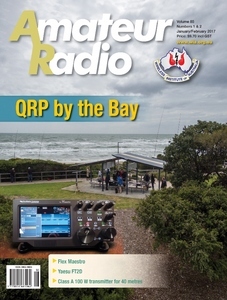 Cover: An overview of the venue for the QRP by the Bay event held in early November 2016. See the report on page 22. Inset shows the FlexRadio Systems Maestro control console for the FLEX-6000 series transceivers. A brief review appears on page 19. Main photo by Andrew Scott VK3BQ, inset photo by Brian Morgan VK7RR/4. The WIA Board has changed dramatically since my last President’s Comment. At the end of November, the WIA Secretary received letters from just over 100 members calling for a general meeting for the removal of four serving Directors, myself included. This followed a lengthy, concerted campaign on social media, and on-air. Shortly after, the Secretary received additional motions to be put to the same meeting calling for the removal of the three other Directors, and the appointment of two new Directors. The Board was unsure of the validity of the second motions, or if they could be put to the same meeting, and agreed unanimously to seek legal opinion. The WIA’s solicitor referred the matter to a Melbourne-based barrister. In the meantime, the WIA Board was busy organising the venue, and working out how letters could be sent to members over the Christmas period, giving the required notice under the WIA’s Constitution. The barrister made a number of determinations that have been published on the WIA website, but his most important determination was that the call for the general meeting by 100 members was not valid due to fact that a number of applications were incomplete. This took the WIA Board by surprise. It was not the outcome we were expecting, but to proceed with the general meeting would leave the outcome of any motion open for challenge - a very expensive waste of time and effort for everyone. Subsequently, two WIA Directors and the Treasurer and Assistant Treasurer resigned their positions. The WIA Board now comprises five Directors and a Secretary. This is the minimum number of Directors allowed under the Constitution. Four of the remaining Director positions are due for re-election in May this year, as the Constitution provides. I have made a decision to end my term this year also, in order to allow a full Board election. It would be possible for the Board to appoint new Directors to those positions not up for re-election this year, but the Board’s view is that, under the circumstances, a proper democratic election process, where all members can vote on all Board positions, is the best way to proceed. In the short-term, the Board will be using an external firm of accountants to provide financial guidance to the WIA. Interestingly, one firm approached does a lot of work for other voluntary not-for-profit organisations that choose to use external accountants rather than rely on their own members for this function. Maybe it’s a general sign of the times. The Board has also decided to upgrade the yearly financial Review to a financial Audit. We believe this will give members confidence that the WIA accounts are in order. The WIA’s Auditor was appointed at the last AGM, and upgrading the yearly Review to an Audit is the most cost effective way to proceed, rather than appointing an additional Auditing firm. Hopefully, all that is behind us now, and we can all get on with what we are supposed to be doing for members, and there is a lot to do. The current work program includes; working to reverse, or at least slow down, the declining WIA membership trend; preparing for the yearly financial Audit and the subsequent reporting to the ACMA on last year’s examinations and callsign business activity (this is required under the Deed with the Commonwealth); continuing to negotiate with the ACMA on improvements to the Amateur Licence Conditions, including the proposed new 60 metre amateur allocation gained at WRC-15; the completion of the new volunteer charter designed to improve how the WIA’s army of volunteers works with the Board and stakeholders; implement a formal means of consultation with members and the wider radio amateur community; devising additional revenue streams to reduce reliance on membership income, and so on. The most important of these activities right now is reversing the downward trend in WIA membership. After a period of relative stability in 2014 and 2015, membership numbers have fallen by almost 300 in 2016. Although there are probably a multitude of contributing factors, including the age profile of the membership and the current low returns from superannuation accounts relied on by self-funded retirees, I believe events over the past year and the constant negative sentiments about the WIA aired on social media and elsewhere are a major contributing factor. If you are one of those who feel disenchanted by recent events and have let your membership lapse, or are considering doing so, please reconsider in the interests of your hobby, if for no other reason. You might also take a look at many recent news releases on the WIA website and weekly VK1WIA broadcast that address issues raised and correct much of the misinformation going around. Remember, size matters. Only a strong WIA can properly represent the interests of radio amateurs to government and industry, continue our role in licensing new amateurs and in supporting the radio amateur community in many diverse ways. 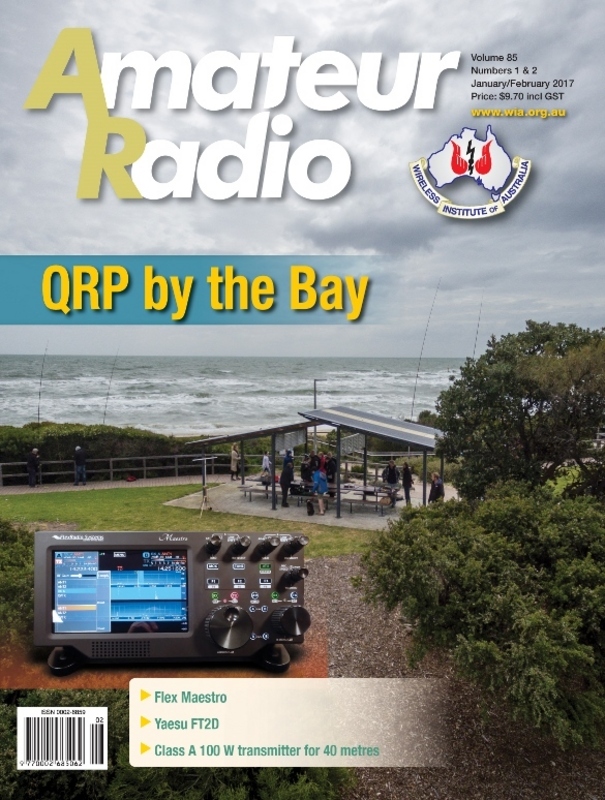 In a change from his usual offering of technical articles describing QRP equipment, the authors gives us an account of the successful gathering of QRP enthusiasts at Chelsea beach on Port Phillip Bay in November 2016. The authors present an account of the arrangements required to take some microwave equipment to Norfolk Island for an afternoon of fun communications on the 9 cm and 3 cm bands. The author presents a review of the FT2D handheld transceiver, another offering in the Yaesu System Fusion collection of transceivers. The author presents a complete 100 W AM transmitter design for the 40 m band, using a Class D amplifier.